This year marks the 34th Ukrainian Festival. The annual event is always a popular one and with good reason...good food. 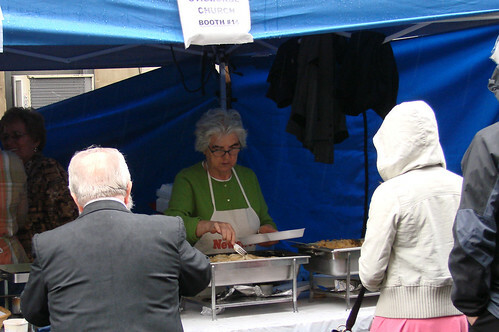 Two years ago, I hit up the St. George's Festival on a rainy Sunday afternoon and even with the rain they ran out of their homemade borscht and the stuffed cabbage. Right now this weekend is looking sunny and pleasant, so you can bet there will be crowds. But the tasty tender and buttery varenyky prepared by the good ladies of St. George's Catholic Church are worth the wait and make this one of my favorite church festivals of the year next to the Myanmar Baptist Church Food and Fun Fair. Do you have a favorite church festival for good eats? May 14-16, 2010 on 7th Street between 2nd and 3rd Avenues. That looks fabulously yummy! 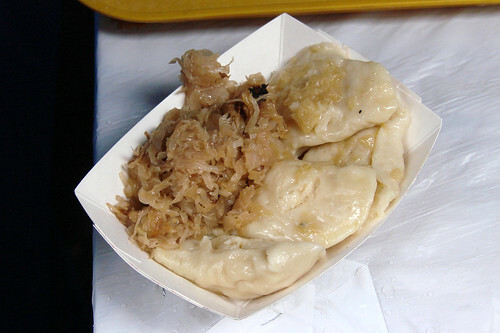 I love potato filled dumplings - er Polish Pierogi - and think kraut filled are my favorite ... served with butter and plenty of onions.